Are you looking for a fun & simple Halloween or fall harvest craft to do with your kids? We’ve got a variety of ideas that we’ve compiled for you – everything from spiders, bats, pumpkins, black cats & more! 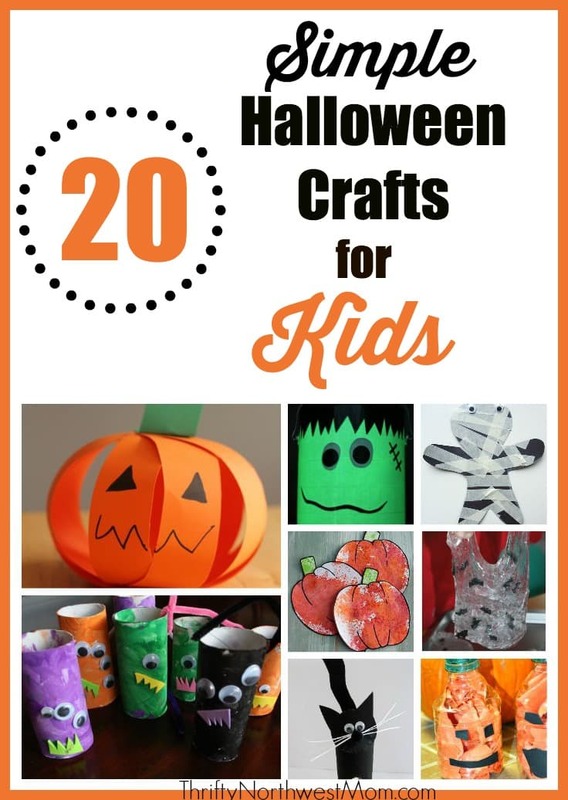 Most of these crafts use simple supplies, many you may already have around the house, and are fun to get kids to make this time of the year if your looking for easy Halloween crafts. 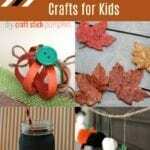 Many of these projects are great Halloween craft for preschoolers, as well as younger school age kids. Make sure to check out our Fall Family Fun page with even more great ideas for this time of the year – delicious fall recipes, Halloween party ideas, family fun activities & more! 1. Paper Plate Spiders from I Heart Crafty Things – these ones are so fun, and super easy. Best part is that it uses simple paper plates, that you may already have in your pantry! 2. Lego Stamped Pumpkin Craft from Crafty Morning – Use the large size legos to make a fun stamped pumpkin. 3. Hand Print Spiders or Cottonball Ghosts from The Chirping Moms – cotton balls, paper, glue or paint will provide lots of fun for your kids with these projects. 4. Masking Tape Mummy from No Time For Flash Cards – masking tape is transformed into a mummy with this craft. 5. Bat Slime from Little Bins for Little Hands – This project will be popular with any kiddo who loves slime! 6. Monster Mobile from Toilet Paper Rolls from Happy Hooligans – you can use toilet paper rolls or buy them new from craft stores for this fun monster mobile. 7. Spooky Spiders from Simple as That – Googlie eyes make this project extra fun. 8. Scissor Skill Pumpkin from Nurture Store – Construction paper is the base of this craft that will let kids practice their scissor skills. 9. Kool-Aid Pumpkins from Housing a Forest – turn Kool Aid into pain for these paper pumpkins. 10. Water Bottle Pumpkin Jack-O-Lantern from Motherhood on a Dime – Fun way to upcycle water bottles into something cool and new. 11. Q-Tip Skeleton from How Wee Learn – use dollar store beauty items to make a skeleton. 12. Halloween Surprise Eruption from Simple Fun for Kids – fun interactive and learning experiment for kids. 13. No Sew Ghost Hand Puppet from Mama Smiles – love this, make hand puppets for the kids, no sewing skills required! 14. 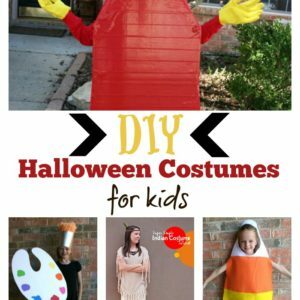 Easy Dress Up Hats from Reading Confetti – these are fun halloween themed hats you can make from paper plates! 15. Glow In The Dark Trick or Treat Bucket from Not Just a Housewife – this is one of my kids favorites! Use duct tape to make great trick or treat buckets. 16. Halloween Wreath from No Time For Flash Cards – Lentils, glue and paper plates make fun wreaths you can decorate the house with. 17. Water Color Resist Spider Web Art from I Heart Arts n Crafts – use pom poms to make a fun furry spider. 18. Fingerprint Bat Silhouette from Crafty Morning – if your kids like bats, this is a fun one. 19. Candy Corn Man craft from Meaningful Mama – who doesn’t love candy corn! 20. Pumpkin Spice Playdough – This one smells good, and is made from items many of us have in the kitchen.